After the tumultuous episode storm that was “Faith,” Outlander eased up ever so slightly on the darkness for “The Fox’s Lair,” an episode that puts a lot of distance between the Frasers and all that happened in Paris. Jamie and Claire have returned home to the Highlands to heal, as Claire lets us know in voiceover. A significant though unspecified amount of time has passed. Claire and Jamie, on the whole, seem to be doing much better—in their marriage and in their grieving. Jamie still wakes in the middle of the night, unable to sleep. 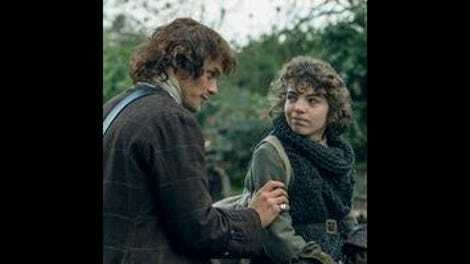 But his sister Jenny, who they’re staying with in Lallybroch, has had another baby, so Jamie talks with the infant in the middle of the night. That scene, of Jamie slowly rocking and speaking to the baby in his native tongue, as Claire and Jenny watch on, sad and hopeful all at once, is by far the best part of the episode. It’s quiet and lacks action, but it’s so fixed in the characters’ emotions, and it’s really the only time we see any parts of this “healing process” Claire says they’ve come to the Highlands for. The time jump was ultimately the right choice. “The Fox’s Lair” gives Outlander some momentum, especially when it comes to the meat of this season’s action. But it was a little jarring jumping into such a plot-heavy episode steeped in politics and schemes after the more character-driven storytelling in “Faith.” Anne Kenney, who wrote the episode, must have anticipated that, pouring a lot of emotional depth into the scene of Jamie with the baby, a scene that earns the right to be a little longer than necessary. It feels real. From there, things get a little weird. Jenny and Jamie’s opportunistic and repulsive grandfather, Lord Lovat, is rather hamfistedly thrown into the mix, and Colum Mackenzie returns. The crux of the episode rests in Jamie and Claire’s attempts to manipulate Lovat into supporting Prince Charles’ rebellion. Colum, meanwhile, attempts to persuade Lovat to side with the Mackenzie position of neutrality. Oh, and Laoghaire shows up again, born-again and begging for Claire’s forgiveness. Of all the strange developments in “The Fox’s Lair,” Laoghaire’s presence is the most confusing. This character has never really worked for me, and I thought we had seen the last of her after she sent Claire to death’s door last season. Laoghaire ultimately helping Claire and Jamie here was not exactly catharsis I craved, and it was disappointing to see that the character still only bears one defining quality: her obsessive love for Jamie. Outlander excels at crafting real, complicated characters. Laoghaire is not one of them. There are a few scenes that get dragged too deeply into the specifics of the war and its politics, and there isn’t quite enough Claire in the episode. Still, overall, “The Fox’s Lair” has some fun. As with “Faith,” strange supernatural elements weave their way into the story. Claire and Jamie play up the La Dame Blanche schtick to work to their advantage. Both characters perform over-the-top theatrics, with Jamie throwing his drink into the fire to punctuate his monologue to Lovat of how his wife is indeed the white witch. Claire outdoes the work she does in “Faith,” going full witch and then some as she pretends to have a vision of Lovat’s execution, a vision fed to her by Lovat’s own seer. Outlander has a fascinating relationship with the supernatural. Claire, obviously, isn’t actually a witch. She is a time-traveller who possesses powerful knowledge. But beyond the time-travel aspect, Outlander stays away from fantasy. It’s a solid choice, letting the conflict and drama of the show brew in ways that are grounded. Claire and Jamie don’t have supernatural powers in “The Fox’s Lair,” but rather the very real power of deception and manipulation. It makes for more compelling storytelling. Some of their dramatics are a bit much here, but that adds some fun. The change of course for Jamie and Claire’s plan is also the right direction. Something about their schemes in Paris was just off. Claire and Jamie were almost too good at infiltrating the politics of this war, at playing their new roles in order to change the future. Jamie all of a sudden was some political mastermind and wine salesman who played chess. And Claire suddenly knew how to run an entire house on her own. It was all a little too convenient for the story. Jamie’s decision to just lean into it all and fight the war seems more suited for him and his skills. They’re back where they belong, but they’re charging forward, too. Of course, we know that they will lose. That casts a dark shadow over all that happens on the way to Culloden. We know Jamie and Claire will ultimately fail, so Outlander has to find ways to keep making the journey matter. “The Fox’s Lair” is engaging enough, but it lacks the captivating performances that buoy the show beyond its plot. Outlander is gearing up for war, but it needs to focus back in on the soldiers. Fergus is perfect and also looks like he could be Claire and Jamie’s child. Can they officially adopt him, please? Laoghaire and Claire talking about the witch trial from last season was the only real mention of Geillis so far this season. I miss Geillis. I know we’re to presume she’s dead, but I want to believe she found a way out of that situation. I’m really just hoping she was a real witch after all. Lovat really wants Lallybroch, so I have a feeling that will come back into play at some point. I keep wondering if the food and wine they are all eating and drinking in 18th-century Scotland would actually be good. Claire doesn’t seem to mind.